7th-21st April 2019. Limited availability. First come first served. Not for the fainthearted. Note: The jungle can be a dangerous place. What is the Theatre of the Oppressed? Theatre of the Oppressed was created by Brazillian Theatre Director 'Augusto Boal'. He created a variety of theatre techniques used to democratise theatre and deal with oppression that exists in society. These include Forum Theatre, Invisible Theatre, Image Theatre, Rainbow of Desires and Legislative Theatre. Theatre of the Oppressed is now practiced all over the world in a variety of forms. Theatre of the Oppressed techniques are now part of what's know as the Social Theatre movement, that include other frameworks such as Psychodrama, Dramatherapy, Neuro-Dramatic-Play®, Theatre-in-Education, Play Therapy and more. Social Theatre is theatre for empowerment and social change. What is Theatre of the Oppressed in the Jungle? Actionwork® Theatre and Noh Budget Films have teamed up together to provide you with the ultimate Theatre of the Oppressed training programme. You will spend 2-weeks in Malaysia with us that includes 1-week in the jungle working with a tribe of people called the Temiar. The Temiar are known to be amongst the most peacful people in the world. They are an oppressed people, with logging companies and oil palm plantation corporates cutting down the forest and taking their ancestral land. The Temiar are in the midst of a 10-year struggle to try and claim back some of their ancestral land by peaceful blockades and advocacy. This will be one of the most amazing experiences you will have in your life. 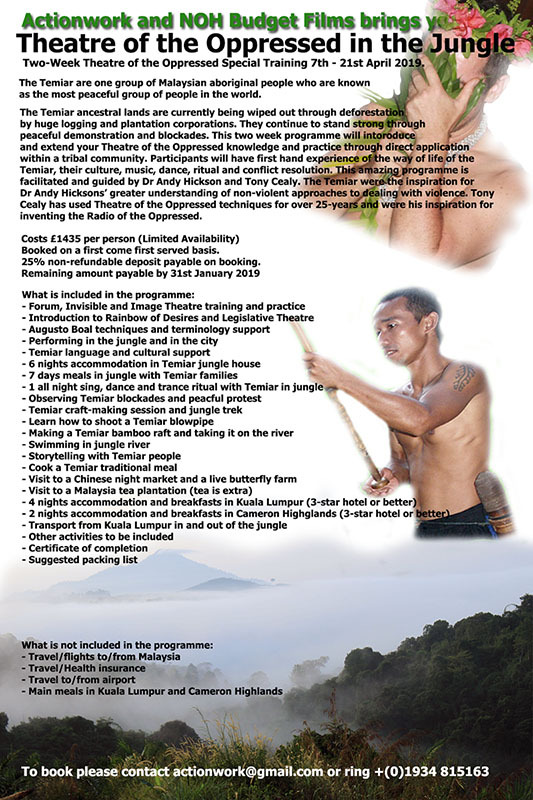 You will spend 2-weeks in Malaysia that includes a week in the jungle learning from one of the most peacful groups of people in the world; the Temiar Orang Asli People. This two week programme will extend your Theatre of the Oppressed knowledge through direct contact with an aboriginal community. Participants will get first hand experience of the way of life of the Temiar, their culture, confict resolution strategies, dreams, rituals and many other facets. You will also be given a suggested packing list and items to bring as presents for aboriginal families you may stay with. Costs: £1435 per person. 25% non-refundable deposit payable on booking. Remaining amount payable by 31st December 2019. Please note that there is limited availability on the this amzing programme. We will be a small group. To book please Contact Us. You will have your training delivered by 2 leading Theatre of the Opressed practitioners; Dr Andy Hickson and Tony Cealy. Tony Cealy is a trainer, tutor, and facilitator using drama and theatre with people at risk. He is the founder member of Noh Budget Films (est. 1991), and since 1993 has won contracts developing drama-based responses to health and wellbeing, mental health, social care, education, substance misuse, housing and regeneration, youth services and community development, and special educational settings across the UK. Over the last 20 years Tony has built a strong reputation for innovative and experimental drama and theatre-based projects within the criminal justice system in the UK and across Europe. These projects are often workshops, plays, films, exhibitions, installations and radio broadcasts. He has spent many hours devising special challenges and new games and exercises, all with the intent of helping people stop coming back to prison. Tony uses theatre and digital video projects in prisons as well as production of cross artform projects that span the divide between prison and the wider public. Tony invented the Radio of the Oppressed and created the UK’s only weekly forum theatre on the air Afro-Caribbean radio soap opera drama www.492kornaklub.com. Dr Andy Hickson is a theatre Director and Social Theatre specialist. CEO and founder of Actionwork® Theatre (est. 1991) He has worked with and attended Theatre of the Oppressed sessions run by Augusto Boal. He has practiced and delivered training on Forum Theatre, Invisible Theatre and Image Theatre throughout the UK and abroad. Andy grew up in the jungle with the Temiar aboriginal people and has successfully organised theatre based training with the Temiar and other indigenous groups here and around the world. Andy produced the worlds first anti-bullying festival and has toured 1000's of shows to schools across Europe, Asia, Africa and South America. His published books and papers include: 'Forum Theatre - Past Present and Future', 'Creative Action Methods in Groupwork', The Groupwork Manual' and 'How to Stop Bullying'. Return to Actionwork creative workshops main page.